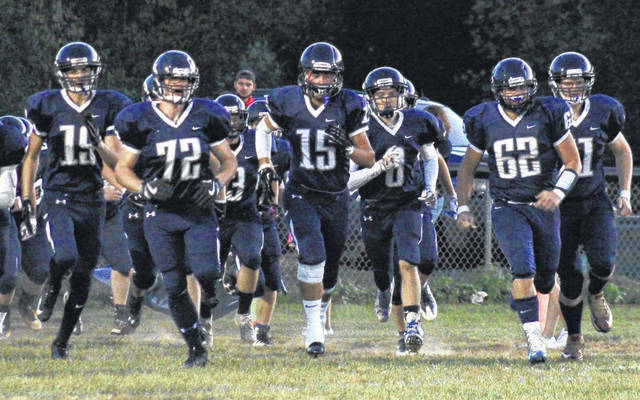 The Wildcats are led onto the field by seniors Alex Lemieux (19), Riley Griffith (72), Logan Nibert (15) Tyler Cochran (8), Nathan McQueen (62) and James Edmonds (right), before the Wildcats’ victory over Jenkins on Sept. 29 in Ashton, W.Va.
Last Week: Meigs lost to Athens 19-18, in The Plains; Point Pleasant lost to Bluefield 42-13, in Bluefield. Last meeting between the teams: Sept. 14, 2007. Point Pleasant won 16-14 in Pomeroy. MHS offense last week: 24 rushing yards, 289 passing yards. PPHS offense last week: 216 rushing yards, 57 passing yards. MHS offensive leaders last week: QB Zach Helton 18-39-1 289 yards, 2TDs; RB Landon Acree 1 carry, 11 yards; WR Cole Adams 6 receptions, 120 yards. PPHS offensive leaders last week: QB Cason Payne 4-16-0 57 yards; RB Justin Brumfield 17 carries, 192 yards, 2TDs. MHS defense last week: 270 rushing yards, 131 passing yards. PPHS defense last week: 384 rushing yards, 131 passing yards. 1. In all-time meetings, Point Pleasant holds a 14-5-1 record against Meigs. The last time these teams met resulted in the first victory in PPHS head coach Dave Darst’s tenure. The Marauders were victorious in their last trip to Mason County, defeating the Big Blacks 35-20 on Sept. 15, 2006. 2. This is just the third home game and the first of three straight at home for the Big Blacks, who are 1-1 at OVB Bank Track and Field this fall. This is Meigs’ fourth road game, with the Maroon and Gold winning one of the previous three. A MHS loss will make the second straight season Meigs finishes below .500 on the road. 3. Through seven games, Meigs has been outgained 2,742-to-2,053 in total offense, including 1,746-to-779 on the ground. Meanwhile Point Pleasant has outgained its seven foes by a 2,849-to-2,113 clip, including 1,785-to-1,038 on the ground. 4. In the WVSSAC Class AA playoff ratings, Point Pleasant currently holds 10th and is one of seven five-win teams. Meigs is currently 12th in the OHSAA Region 27 playoff ratings and the Marauders are the top-rated team with a sub-.500 record. 5. This game will be the Wendy’s Friday Night Rivals Game of the Week presented by the Marshall Sports Medicine Institute. Mark Martin of WCHS will be calling the game live on television, and the game will also be available at wchstv.com on the internet. Check local listings for channel information. Last Week: Wahama defeated Eastern 33-12, in Tuppers Plains; South Gallia lost to Waterford 58-8, in Waterford. Last meeting between the teams: Oct. 14, 2016. South Gallia won 28-20 in Mason. Current head-to-head streak: South Gallia has won 2 straight. WHS offense last week: 302 rushing yards, 0 passing yards. SGHS offense last week: N/A. WHS offensive leaders last week: RB Colton Arrington 17 carries, 139 yards, 1TD. SGHS offensive leaders last week: N/A. WHS defense last week: 84 rushing yards, 94 passing yards. SGHS defense last week: N/A. 1. The White Falcons are 14-2 against SGHS in all-time meetings. The White Falcons’ last trip to Gallia County was on Oct. 16, 2015 and resulted in a 54-19 SGHS victory. 2. This is Wahama’s second straight road game and the White Falcons are looking for back-to-back road wins for the first time since 2014. This is the first of two in a row at home for the Rebels, who are 2-2 in Mercerville this fall. SGHS was 1-3 at home last season, but had at least three home wins in each of the three previous years. 3. So far this season, South Gallia has scored 63 points before halftime and 71 points after the break. The Rebels have allowed 207 points in the first two quarters, but only 72 after that. Meanwhile, Wahama has been outscored 90-to-93 in the first half and 73-to-54 after that. 4. Wahama has moved up to tied for 27th in the WVSSAC Class A playoff ratings. The White Falcons are joined by six other Class A teams with two wins. The Rebels are 20th in the OHSAA Region 27 ratings and SGHS is one of five two-win teams. 5. To this point in the season, Wahama and South Gallia have faced five common opponents, in Waterford, Trimble, Belpre, Eastern and Federal Hocking. The Wildcats, Tomcats and Golden Eagles defeated SGHS by an average of 45 points, while topping Wahama by an average of 20.3 points per game. Eastern defeated South Gallia by 20, but lost to the White Falcons by 21. Both teams defeated FHHS, Wahama by 20 points and South Gallia by 36. Last Week: Paden City lost to Clay-Battelle 32-7, in Paden City; Hannan lost to Beallsville 53-6, in Beallsville. Last meeting between the teams: Oct. 14, 2016. Paden City won 43-20 in Paden City. Current head-to-head streak: Paden City has won 2 straight. PCHS offense last week: N/A. PCHS offensive leaders last week: QB Mike Shreves 9-15 68 yards; RB Ryan Cross 12 carries, 78 yards; WR Bryant McKay 4 receptions, 18 yards, 1TD. 1. Paden City’s last trip to Hannan resulted in a 54-12 PCHS victory. It was the first-ever meeting between the schools. 2. This is Hannan’s fourth of five home games scheduled this season, with the next not coming until Nov. 3. HHS is 1-2 at home so far this year, after finishing 2-3 in Ashton last fall. Paden City is 1-1 on the road this season and will also travel the next two weeks. 3. Through six games, Hannan has been outscored 154-to-94. Meanwhile, PCHS has been outscored 231-to-103 in six games. HHS has been shut out twice this fall, while the visiting Wildcats have been blanked once. 4. In the WVSSAC Class A playoff ratings, Hannan is alone in 29th, while Paden City is tied for 34th. A total of 21 Class A schools enter Week 8 with a sub-.500 record. 5. To this point in the season, the lone common opponent between these schools is Hundred. PCHS traveled to top the Hornets by a 54-6 count on Sept. 22, while Hannan visited and defeated Hundred by a 41-0 count on Sept. 16.